This document was issued in New Bedford to the bark Adeline Gibbs, which was under the command of Moses L Snell, with a carrying capacity of 327 18/100 tons. This carrying capacity was know as “burden,” and from 1789 until 1864, the Americans used a system called Builder’s Old Measurement (BOM or bm), which to calculate capacity. The system included length and beam measurements divided by 95. So, until 1864, the burden ended with a fraction the denominator of which was 95. This passport reflects the modified version of the Moorsum System adopted in the United States in 1864, which uses a denominator of 100, with the fraction in this case being . The vessel was heading from New Bedford bound for the Pacific Ocean, with provisions and stores with utensils for a whaling voyage. This ship was named after the wife and daughter of William Le Baron Gibbs, the senior member of the shipping firm of Gibbs & Jenny of New York and Fairhaven, across from New Bedford. Prior to this voyage the ship made four whaling voyages under the management of Gibbs & Jenny and four under the management of Jonathan Bourne, Jr. The ship finished her life and was broken up in 1889. The Martha’s Vineyard Museum has two logbooks from the Adeline Gibbs earlier voyages. The logbook for this voyage, which began on August 9, 1875 and ended on April 3, 1878, is in the New Bedford Whaling Museum. Capt. Moses Leander Snell was an experienced whaler and was know to be a particularly religious man, but a “hard driver”. Whaling voyages, often lasting three to five years, took ships to remote regions, were especially dangerous for both officers and men, as attested by the 1845 voyage of the Archer. Captain Moses Snell’s carefully worded logbook, parts of which were fraudulently composed to conceal his violence, nevertheless could not hide the fact that his own brother led a mutiny against him. Despite his strict rule, and perhaps because of it, Snell continued to be given commands. 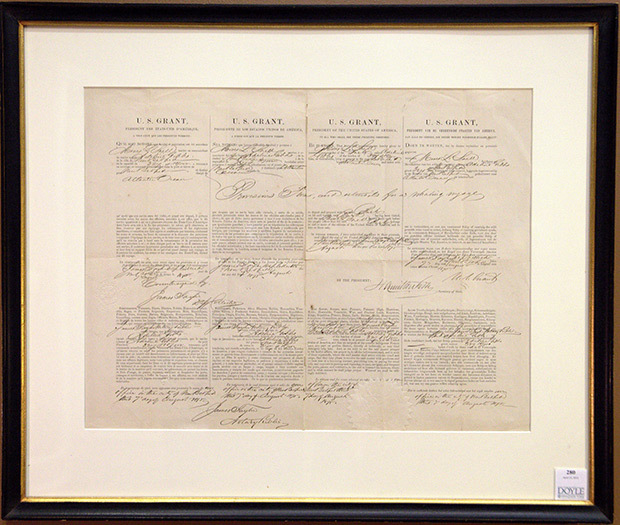 This multi-language sea letter is in four languages: French; Spanish; English; and Dutch and is signed by President Ulysses S. Grant who served two terms from March 4, 1869 until March 4, 1877. Despite the fact that he was elected twice, Grants military style of administration proved ineffective. There were minor scandals over gifts he received and gold speculation, but there is no doubt Grant was honest and well meaning. The document is also signed by Hamilton Fish who served as Governor of New York as well as a U. S. Representative and Senator before accepting Grants appointment as Secretary of State. His primary focus was trying to resolve the claims that had developed over Great Britain’s recognition of the Confederacy and positioning the U.S. government as Cuba struggled for independence from Spain. James Taylor also signed as both Collector of Customs and Notary, despite the fact that the actual Collector of Customs for New Bedford at this time was John A. P. Allen. This sea letter was printed on rag paper and bears the Great Seal of the United States on the right bottom and the embossed seal of the Collector of Customs on the center left.